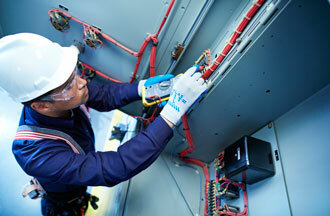 Are you looking for a reliable and high-quality commercial electrical contractor? Look no further than ABM. We are here to help with your Atlanta commercial electrical and lighting services. We offer unmatched experience and expertise in commercial electrical service, and have hundreds of satisfied clients in the Atlanta metropolitan area. As a licensed commercial electrical contractor, ABM offers a comprehensive range of Atlanta lighting and electrical solutions that leverage the latest technologies and equipment -- from commercial electrical repairs and replacement to high efficiency lighting upgrades to proactive planned maintenance that include performance guarantees.